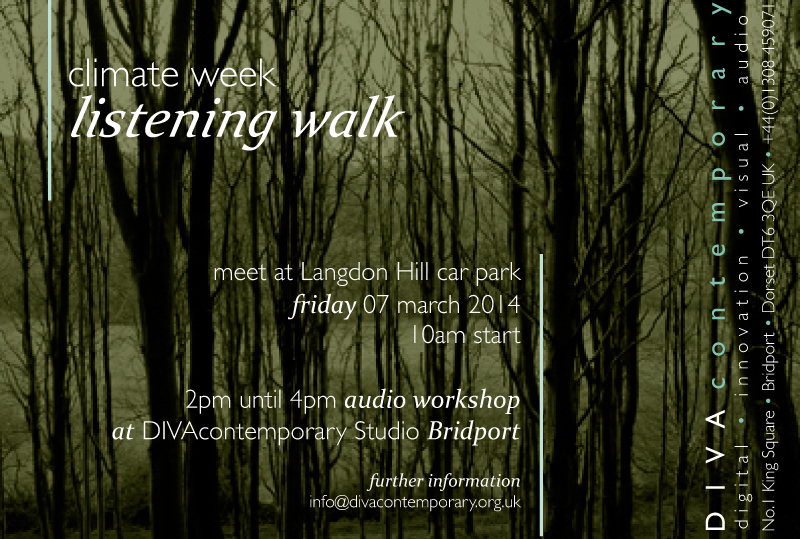 As part of events to mark Climate Week 2014, DIVA contemporary (Bridport) will be running a Listening Walk around Langdon Hill, Chideock on Friday 7th March. Starting at 10am from Langdon Hill car park, Mandy Rathbone and David Rogers will lead a participatory ‘soundwalk’ around Langdon Hill. There will be opportunity to record ‘collect’ sounds that you find interesting, characteristic, out of place or even beautiful. Professional sound recording equipment and advice will be provided. As the walk is quite short (less than 1.5 miles), there will be time to linger and experience the environment audibly as well as visually. From 2 till 4 p.m. DIVA contemporary artists will then lead an afternoon workshop, at DIVA’s studio in central Bridport, introducing the participants to simple sound editing and uploading to the radio aporee maps projects. This is a great opportunity to experience the world of field recording and sound editing, working with experienced and enthusiastic sound artists. This entry was posted in associate artist, audio, David Rogers, Mandy Rathbone, sound walk, soundscape. Bookmark the permalink.